The Martin Yale 1711 Electronic Auto-Folder couldn’t make folding any easier. The Auto-folder automatically folds and stacks documents from 3 ½” x 5” up to 8 ½ X 14” for medium sized businesses with a high demand for easy-to use paper folding. This model has a capacity of up to 150 sheets of paper and can fold up to 9,000 sheets in an hour. 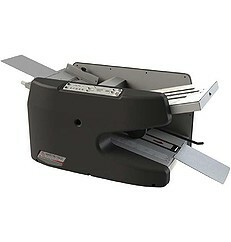 This machine can even fold up to 5 sheets stapled together for easy stapling for stapled documents. With this 1711 Electronic folder it allows you to fold 6 different ways including: letter, half, z-fold, double parallel, right-angle, and baronial with paper sizes of either legal, letter, or A4. There are seventeen preset fold and paper size combinations that are pre-programed into this device with additional options for custom folds. This auto- folder is ideal for mailrooms, churches, associations and offices when easy to use is an important factor. The 1711 offers an improved feed system, removable fold tables, easy access to rollers, improved stacking wheels, and self-centering paper guides. No set-up is necessary with this machine, all you have to do is plug it in and the paper tray automatically feeds and folds a stack of documents. Once the feed tray is empty the auto shut off sensor cuts the power to the motor. This easy operation machine at high speeds provides an efficient folder that will save you money. If you have any questions or are interested in purchasing the Martin Yale 1711 Electronic Auto-Folder, visit us at SpiralBinding.com. We have great pricing on a full line of Friction Feed Paper Folders. Call us at 1-800-631-3572 for more information!